Acoustic Bardic folk music by one of the UK's best musical storytellers. Pagan, Wiccan, Druid folk music - songs of the sacred land, and ancient mythology. 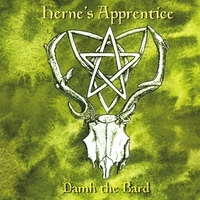 This debut album from Damh the Bard was recorded between October 2001 and January 2002 and is the sum total of two years songwriting and arrangement. The Song of Awen is a celebration of life, and looks at the inspiration that is all around us in the natural world. Often people want to escape the Middle World into less stressful and more romantic realms, but if we are open to the Awen, then the land around us shows itself to be a world of wonder and beauty. Obsession is Damh's idea of a love song, written for that moment when you first meet somebody, and all you can see is their face, and all you can smell is their skin. Blodeuwedd is his muse, and this is the second instalment of the story began with the song Oak Broom and Meadowsweet later recorded on the Spirit of Albion album. Often seen as a betrayer, she was conjured by Math and Gwydion to marry a man she had never met - hardly a firm basis for a lasting relationship! The Fith Fath Song is a traditional shape-shifting song that is usually sung during a Beltane love chase. Gently Johnny is one of the best and most haunting songs from the film The Wicker Man. It is only on the Director’s Cut version, and is also missing from the soundtrack. The Pipes of Pan is another offering to Old Horny and is a ballad about the turning of the Wheel of the Year, and how the beauty of the changing seasons passes so many by unnoticed. Lughnasadh tells the story of the Corn King, from his birth at the Winter Solstice, through to his sacrifice at Lughnasadh. Sules Skerie is a remote island off the coast of Skye where this haunting tale of love and tragedy originates. It tells very much of a Father’s love for his son, which I understand very well. The Selkie tells of a man’s loneliness and how he finds love within the waves of the sea, only to find it out of his reach. The Raggle Taggle Gypsies is another one of those songs that many people have recorded including the Waterboys, the Dolman and Planxty. Learning to Fly is a song for anyone whose life has changed through relationship breakdown, and how it feels, but with a positive message. The Cloak of Feathers concludes the Blodeuwedd trilogy with the Goddess visiting a young man and telling him her story. He listens and he understands that she is not a betrayer, but a woman who yearned to be free. It is love that changes the world. The Winds of Change is a song of hope, for although life can take you along some very dark corridors, the power of change often lies within, and all we need to do is spread our wings and fly! Damh is a Bard whose spirituality is expressed through his music, storytelling and poetry. Drawing on the Bardic traditions his performances are both entertaining and educational, weaving a tapestry of myth, peace, and anthems that speak directly to the heart, but never without a good splash of humour. Damh works within that world of myth that cannot be proved; where the Faerie really do dance on Midsummer's Eve, where the trees talk, and the Hollow Hills take you into the realms of Annwn. Where the Goddess rides her horse, guiding you to magic, and the Horned God of old calls us from the shadows of the Greenwood. Probably my favorite Damh The Bard CD, though each of his is high up on my list. Amazing. Breathtaking - as one of the Old Ones of the age of Hecate, I come from a 300 year old line of the Old Craft, no, we are not new but we are open to new ideas, your music seems to combine the lightness of the new, with the depth and feeling of the old, and I thank you for sharing your gift with the rest of us. I would recommend this to anyone new to the craft who is perhaps searching the pathways, this will certainly help. FFF&F. I purchased this cd and 2 others at the same time once I discovered Damh's music and heard how beautiful it was. Every one of his cd's are 5 star. You have to have them all! From the first song to the last I was moved, inspired, brought high and low and was simply entranced by what is clearly, awen-inspired music. I can't wait to get his other albums! Inspiring, meditative, fun, my guilty pleasure! I discovered Damh the Bard's music by chance. More accurately, I stumbled across his beautiful vocals and amazing instrumental talents after hearing his voice in the background of a YouTube video. I could not give up my search for his albums until I knew who was responsible for such fine pieces of music. I ordered up (bought all the CDs housing his created works to date) without disappointment. Incredible! Damh's music spritually takes me where few have taken me before. What a treat and part of my daily dose of spiritual reflection. CD Baby, I commend you for including such an artist as part of your repertoire. This is a fine CD. Damh the Bard is an excellent musician and poet. His music is heartfelt and has meaning on many levels. I love the folk sound and also like how the subject matter varies from song to song. It's nice to hear music with a message that isn't preachy. The music on this CD is beautiful and uplifting. I love it!